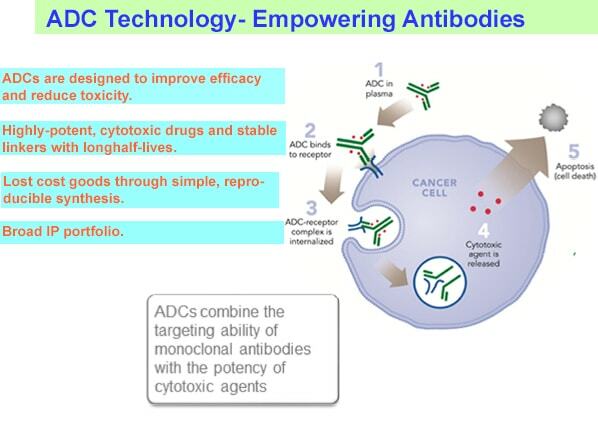 GAP has more than a decade of experience in Antibody Drug Conjugate (ADC) technology, which empowers monoclonal antibodies (figure 1) to treat the targeted diseased area more effectively. ADCs are designed to be stable in circulation and to effect intracellular drug release following antigen-specific binding and internalization of the ADC. Currently the use of ADCs is focused almost exclusively on the treatment of cancer. In contrast to small molecules or function blocking MAbs (monoclonal antibodies), the targets for ADCs do not need to be the causative agents in tumor progression. We have developed proprietary, industry-leading technology that employs a monoclonal antibody specific for a tumor-associated antigen, plus synthetic cytotoxic agents connected by stable linker systems designed to securely bind the cytotoxic agent to the antibody and then release the agent within the targeted cell. With this approach, non-targeted cells are spared which further reduces the toxic effects of traditional chemotherapy, while enhancing the ultimate antitumor activities. Antibody drug conjugates consists of a MAb, chemically coupled to a linker and cytotoxic drug (Figure 2). The key components of our Antibody Drug Conjugate technology are the stable linkers and the synthetic cytotoxic agents. Our ADCs at various phases of clinical trials have been shown to be approximately 5 times more efficacious and roughly 10 times safer than the conventional chemotherapeutic agents.